"I didn't achieve what I wanted to..."
And we promise ourselves, "Next year will be the best year ever." What are you doing to make that happen? "Nothing?" and miss out on the success you crave. Join Dynamic Year™ to build a plan to set you and your goals up for success. 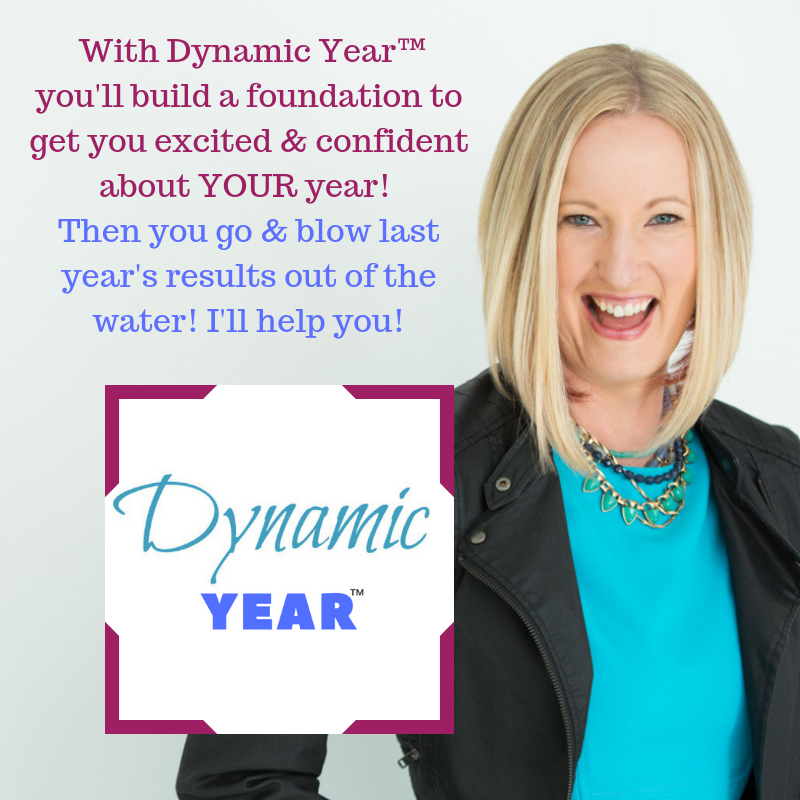 Make this year a Dynamic Year™ created by a Dynamic You™! + 1 Day LIVE Event! to build the foundation for 2020! The Dynamic Year™ program gives you the chance to look at the past year to capture the good, release the bad and move forward with the golden nuggets we have uncovered. You get all info, tools, templates you need to be able complete the 3 Step Foundation for a great new year. Third Step: Guidelines: Looking at the 1st and 2nd step create clear guidelines to set up success in 2018. "How would reviewing my year make things any better than they are now?" You won't miss out on your greatest motivator…achievement: As adults I still see this in my clients, and friends all the time. We have successes and we skip past them to get onto the next task. Not celebrating at all. Then when we don't succeed we dwell on our failures, we beat ourselves up and we can't seem to get going again. Highly successful people and companies know the benefits of reviewing their year. You'll stop making the same mistakes: The BIGGEST wasted resource is the learning from our experiences. Instead of capitalizing on this wealth of knowledge it slips through our fingers and is usually just forgotten. So often we just jump into the next year and set up some big goals, make the same mistakes and then wonder why we have similar results. You'll say goodbye to overwhelm and indecision: By the end of the program you'll have your three guidelines clearly defined. These are crucial in setting the path for your goals. Having them enables you to have clarity in what you want so you can make future decisions easily and confidently. Without them, you'll feel the overwhelm that comes with making important decisions and lose the confidence that you are doing the right thing. ​AND get the Home Learning Program as my GIFT! ​See below and to the right what others got out of their investment in themselves! "I'm a big fan of this program. I left with practical tips to stay focused for the year, and a whole lot of inspiration. That inspiration came from reviewing how much I really did accomplish last year. What better business rocket fuel exists than to have useful tools and lots of inspiration?" ~ Lindsay Hindle owner of Five Sights Co.
"Dynamic Year™ has provided me with clarity and direction and has helped me clear the path toward my goals. I have clarity on what has worked for me in the past and will lead me to further success, as well as things I need to let go off. This program is fun and inspirational and a great way to start the year." Yes! I want clarity and golden nuggets for next year! What sets this program apart from books and other programs? Highly Interactive because of the worksheets you get to use at each step! Live audio content helps you feel like we are working 1:1. Work through at your own pace, your own schedule, and even on your own couch! BEST investment you could make for not only your life but for your biz or career. Can come back to it year after year. Won’t have to rely on memory to do it correctly. Can listen to the audio segments again and again. I’m right there, coaching you every time you need to review your year. Like having me on your shelf! What Have Other Ladies said About this Workshop? “I had the privilege of attending Diane’s Dynamic Year workshop, and I can’t recommend it (and HER) enough! It was an incredible day of self-discovery and relationships that I’ll cherish forever. I loved being able to share my challenges and successes with a group of inspiring women and to hear their stories and insights in exchange. It was absolutely empowering. I highly encourage you to join this program if you want to go into your year with a sense of clarity and to unlock resources that will help you reach your personal or professional goals. Dynamic Year is an experience you don’t want to miss!" I stand so solidly behind this program, I will make it totally risk free for you. Register today. Join the program. Participate fully. If you don’t see the program as valuable – I’ll offer FULL TUITION BACK for up to 1 full year after the program. Sign up now to get that guarantee.